About thirty years ago, it seemed like the preferred method of family transportation was the classic station wagon. Tons of room, seats everywhere, and of course you couldn't beat the styling. Fast forward ten years and we moved into the age of the Minivan. Everyone loved that sliding door on only one side and you could have van accommodations without looking like Buffalo Bill. Next was the SUV craze of the 90s. Everyone had to have the Grand Cherokee, Expedition, or Hummer. The minivan was considered lame and the full frame, V8 SUV was the ticket out. Jump to the present where gas is almost $4 a gallon depending on where you live and fuel economy numbers are the top selling feature of a vehicle. The crossover SUV has become a staple among American Moms and families over the past few years. They offer SUV like accommodations, somewhat rugged looks and of course nice fuel economy figures we can all live with. In the garage this time is the 2014 Nissan Rogue. This is an interesting segment to drive and discuss because you really have to put yourself into the SUV mindset, but at the same time you won't be doing anything a "real" SUV was meant to do 15 years ago. The Rogue, Escape, Equinox, and CR-V are all in this same segment. They offer the SUV looks but are worthless off-road and are basically sitting on a regular car chassis. That is totally fine though, we have continued to evolve from the Family Truckster the past 30 years and the Nissan Rogue is proof that we have come a long way. In this segment of vehicles, it takes quite a bit to stick out and be the one you would pick for your family. The looks of the Rogue for 2014 have changed immensely. Nissan got rid of the Murano-esque front grille and kept going from there. The styling is mildly aggressive and has little bits of excitement with the slick LED lighting up front and the larger clear overlays on the taillights. Body fitment and build quality are right on par with anything out there nowadays, this almost is a dead issue as it seems every car maker knows how to fit sheet metal properly. The 18" wheels look a little 90s lame to me, but they aren't totally awful. When looking at certain angles I see a little bit of the Nissan Leaf in the body creases, which gives the Rogue that futuristic look and also a deep down psychological association of fuel economy. The styling of the rogue is nice, not game changing or anything too drastic, but overall nice. Our test vehicle was the Rogue SL model with front wheel drive. All Wheel Drive is an optional extra on the Rogue. It is powered by the 2.5L inline four cylinder engine and the Xtronic CVT continuously variable transmission. This setup offers up 170hp and 175lb-ft of torque. There is clearly enough power for your daily needs, but when you wind this thing out to merge onto a busy Florida highway, it really screams. When I say screams, it sounds very sketchy and almost like you are pushing it too hard. The shifts are smooth, continuous, and you can tell when they happen. The Rogue doesn't feel like it is hunting for a gear, but more smoothly rolling into the next one. The rpms are kept higher while you are flat out and the sport button on the dash keeps the shifts hanging up longer. This vehicle is by no means a power monster, but it has enough to get you around town for your families needs. The sounds coming from the drivetrain will take some getting used to though. 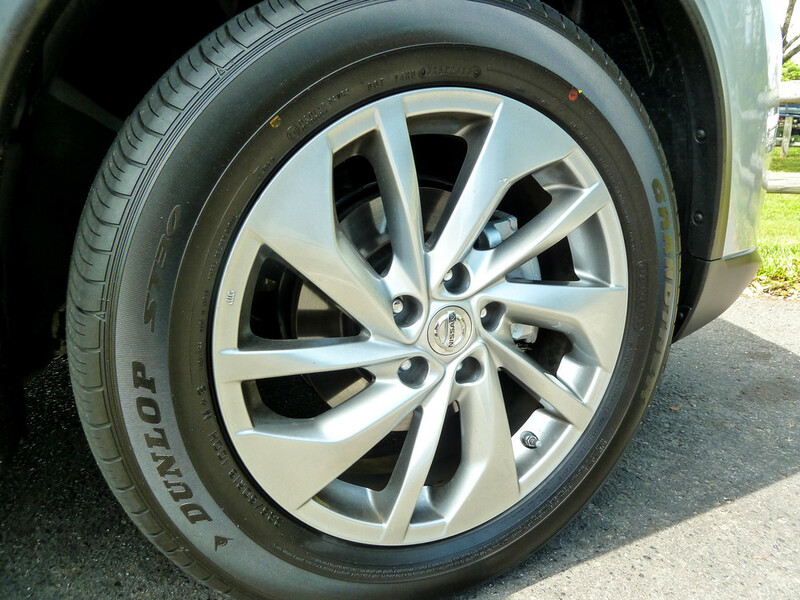 Four wheel disc brakes offer up no issues with stopping and the four wheel independent suspension rides comfortably. The SL Premium Package that this model was equipped with offered up a barrage of driver aides which I got a chance to try out. The lane departure warning dings when you switch lanes with no turn signal, or if you nod off. 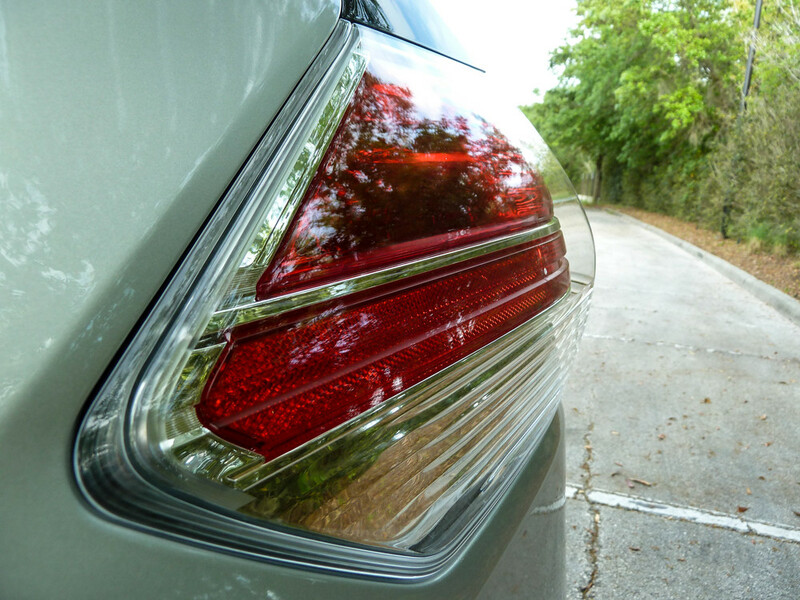 The blind spot warning gave a small amber light next to your side view mirrors if somebody was sitting in that spot next to you. The forward collision warning system wouldn't work for some reason. I felt a little uncomfortable trying this feature out, as I'm sure you can imagine. At one point another writer was dangerously close to the front of the Rogue and we were not warned or anything. Not sure if the warning comes too late or what. The Rogue does what it is supposed to do though while you drive it. Nissan didn't design this to break top speed records or corner like their GTR. For a modern day Family Truckster, it drives along exactly like it was meant to. The interior of the Rogue is loaded with fun stuff. Our SL had heated leather seats, a big 7" screen with navigation, a driver assist display between the gauges, Bose sound, the big panoramic moonroof, dual zone climate control, and embroidered floor mats. This really is the Rogue you want if you can swing it. Nissan went with the fake carbon fiber on the door panels and lots of gloss piano black randomly splashed throughout. This stuff looks very neat in a dealership information booklet, but each time we review a vehicle equipped like this the charm wears off quickly. The piano black gets fingerprinted easily, scratches over time, and is a nightmare to photograph. I feel like I am constantly cleaning my own fingerprints off everything. One interesting thing on this interior is the placement of some random buttons. Down by my left knee, there are spots for 8 buttons. The placement seems like an afterthought and even though our Rogue was top of the line, only 5 spots were filled while the rest had the blank plastic inserts instead. They were not crazy important buttons for the driving experience, but I was having to look down and see what each one was when I wanted to use them. NASA inspired Zero Gravity front seats are one of their selling points. In all honesty they just felt like normal seats to me, I wish I had more to say about that. The rear seats were clever in that they slid back and forth for more legroom. I thought this was a nice touch. 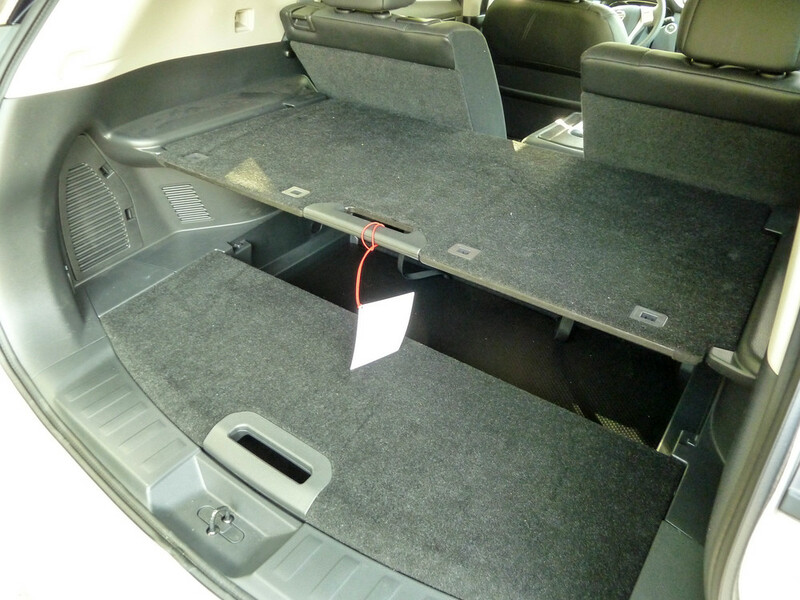 The fully automatic rear hatch opens up to reveal a large cargo area, which is plenty big enough for all your gear. One feature which really was odd Nissan calls the Divide-N-Hide Cargo System. I messed with it for ten minutes before giving up. Somehow, it is meant to adjust and give you a shelf type of setup or divisions for your cargo. Either way it seemed clunky and I just didn't have the patience to figure it out. The Rogue has a great interior though, very well built and the use of quality materials is present. With only the minor shortcomings mentioned above, this is right on par with new cars everywhere for 2014. Our tester Rogue pretty much came with everything. 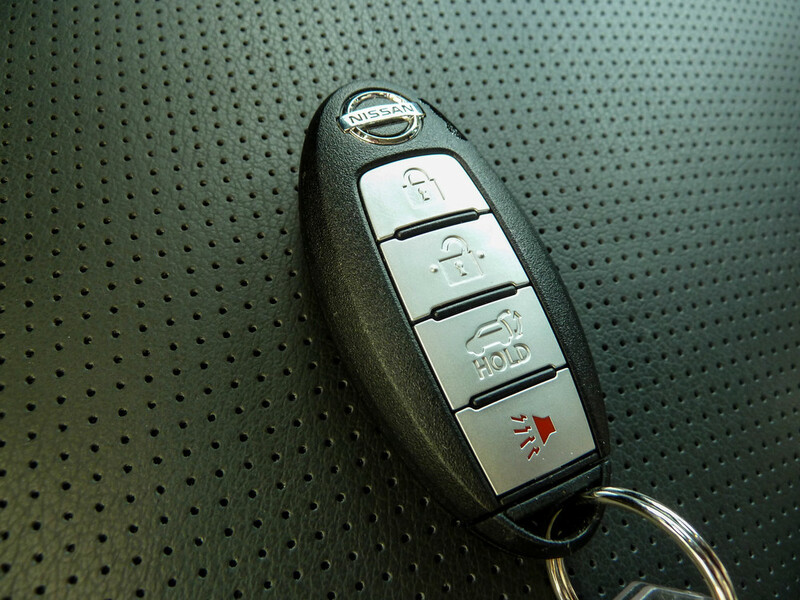 From the start, you can tell it is loaded up when the keyless entry system works flawlessly. Walk up, press the button on the door handle and you are in. The 7" color touch screen offers up tons of features. Navigation, Bluetooth, Sirius Satellite Radio, voice control, and iPod/iPhone integration. There are even features on the screen that show the weather and traffic, which all works through the satellite system. The phone calls were clean and crisp, but when using navigation and the hands-free phone system, the Rogue's voice would cut off the person on the other line, taking priority. I guess that makes sense, but it was kind of annoying hearing my contact get cutoff then hearing them mid-sentence after she finished her route directions. Nissan also offers up an app suite for your iDevice that works with the system in the Rogue. We downloaded the app, but found an account was needed and for a test like this found it to be to much of a burden since we had so many other features to evaluate. I did hook up my iPhone through the Bluetooth and the USB port which was right below the HVAC controls. The 9 speaker Bose audio sounded great with whatever I wanted to play from my phone. Nissan even has the super clever Bose subwoofer mounted in the spare tire below the cargo area. I love how they can use this space for something good and it fits in a neat little package. The coolest feature of this nav screen was what Nissan calls the Around View Monitor. This is one of those you must see to believe features. The Rogue has four cameras which process an image on the screen. The screen then shows you a birds eye view of your vehicle for easier parking. It literally looks like a drone plane is hovering over your car sending you a live feed to guide your parking. This was very impressive and actually worked, not gimmicky at all. Finally, we were able to play with the driver information screen between the gauges. These small LCD screens are becoming more and more prevalent on vehicles anymore. They offer you information without having to look to that massive 7" screen in the center of the dash. 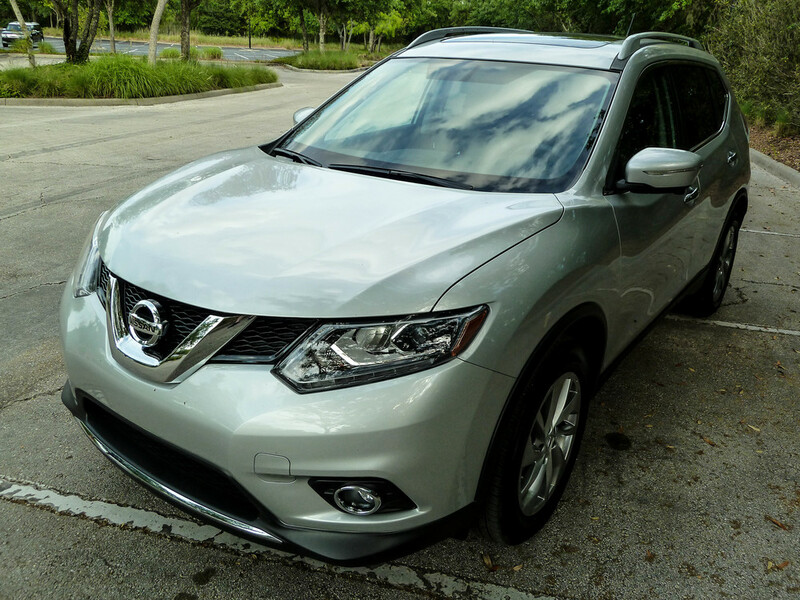 The Rogue gave radio information, navigation, and also vehicle statistics like mileage and tire pressure. There is also access to vehicle settings through this screen, super handy. The Rogue isn't much of a head turner. Even though this is a brand new model and is the top of the line SL trim, the Griswold's Family Truckster got more looks than our Rogue. With that being said, I don't think any of the vehicles in this segment warrant a second glance. They are all purpose built, just like the wagons and vans of the past. Nobody would get excited about a minivan in 1989 unless you were the one buying it. The same goes for the Rogue, as most people won't notice you in this car. That really isn't the point though is it? The crossover vehicle is meant to be used for utility and transportation. 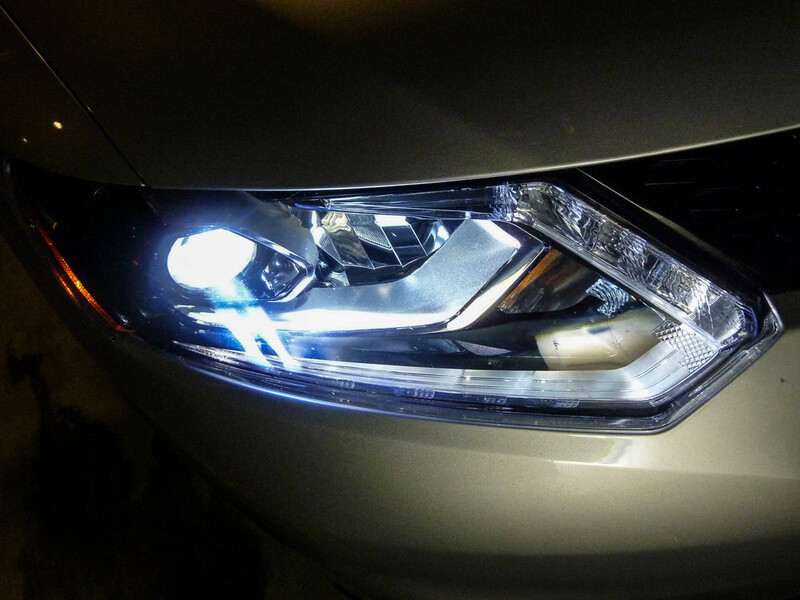 Nissan didn't have headturning in mind when they thought this one up, and that is just fine. As the driver of this vehicle, I felt all my needs had been met. I was comfortable, it ran great, had plenty of room for everyone and everything, the looks were well suited, and I knew what I had this Rogue for. If I wanted to take the whole tribe cross country, then this was the automobile I would have driven, even without the optional Rally Fun Package. Clean looks and a big improvement over the previous model. Loaded! The features and creature comforts help you forget you just bought a crossover. 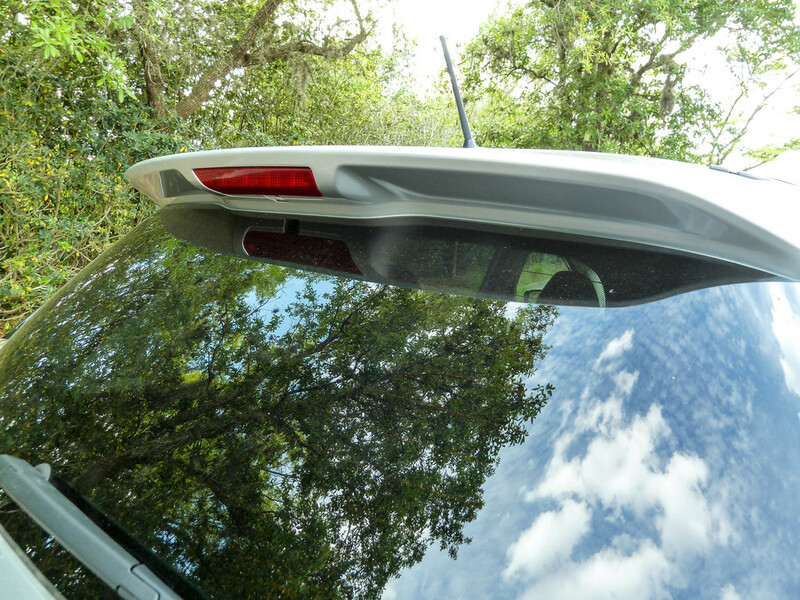 Around View System - The coolest feature on the Rogue, no questions asked. Gimmicks - The Zero-G Seats and Divide-N-Hide all are lame selling features that had more effort put into their name than the actual feature itself. CVT Shifting takes some getting used to. High RPM sounds very sketchy.. 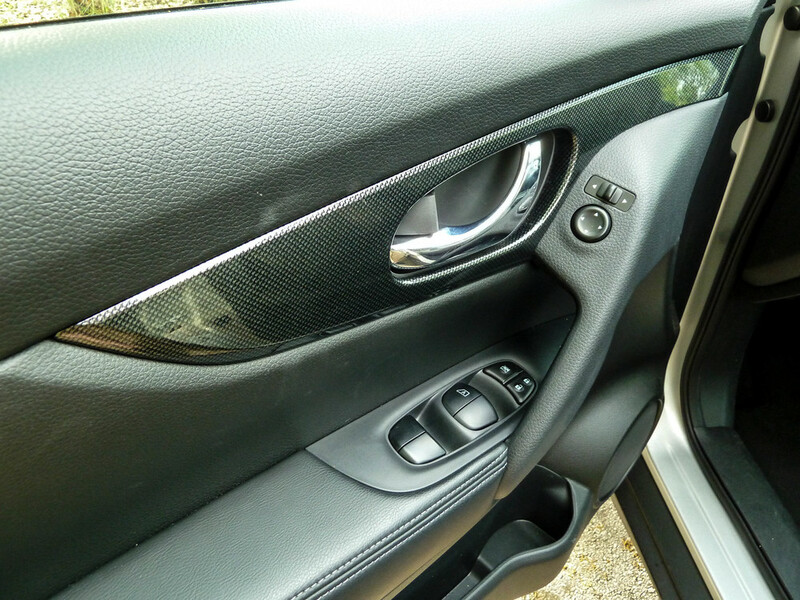 Interior Quirks - Button placements and piano black need to be remedied on the next refresh. The Family Truckster we photographed next to our 2014 Rogue belongs to a family who has gotten some national attention. They were in the middle of a Walt Disney World vacation when we stumbled upon their amazing piece of automotive and movie history. Check them out at http://griswoldfamilyvacations.com or @GriswoldVac.